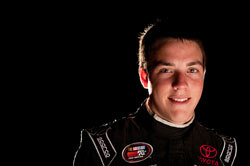 Alex Bowman is part of a young trio of drivers for the newly formed X Team Racing in the NASCAR K&N Pro Series East. All three drivers are in the top 10 in the East Series standings after seven races. Bowman's teammate, Matt DiBenedetto, has already won a race and is second in the East Series standings. His other teammate, Coleman Pressley, has won two poles and has three top-five finishes in seven races. Bowman hasn't quite experienced the same success as his teammates. He is seventh in the East Series standings and has four top 10s. 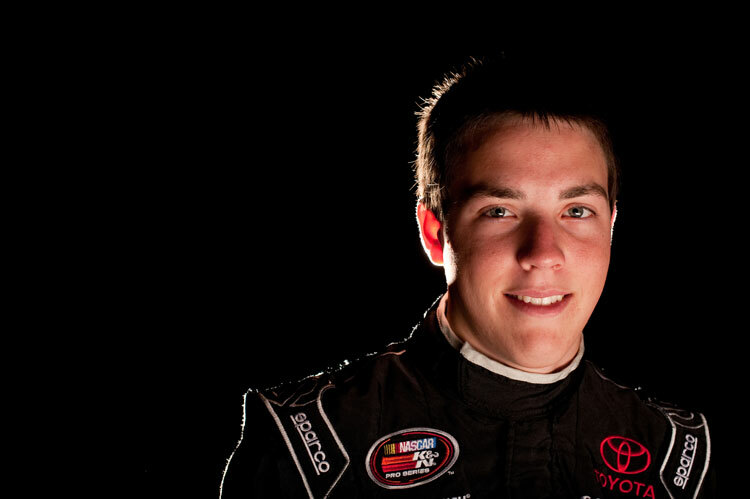 But he has been making strides in his rookie season in the K&N Pro Series East and is one of the Next 9 drivers chosen by NASCAR. The 18-year-old Bowman, who is leading the K&N Pro Series East rookie standings, started his auto racing career in quarter midgets racing in Arizona and California. 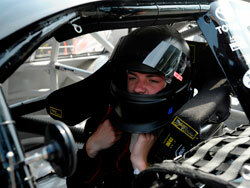 He rose through the ranks of USAC before making the switch to stock cars last year. He admits he is still learning how to race stocks cars and that is part of the reason he is a bit behind his teammates at X Team Racing. Alex Bowman started out the season with three top 10s in a row. He said he felt like he had a chance to win the K&N Pro Series race at Iowa Speedway, which pitted drivers from the East and West Series. He also said his qualifying runs have improved as the season unfolded. In the most recent K&N Pro Series East race at Langley Speedway in Virginia, he started on the front row, next to Pressley who won the pole, and led the first lap of the race. "It's tough. I think Iowa we had a really good shot," Bowman said. "Qualifying I've definitely improved on. I led a lap at Langley, that was the first time I've led a lap. I cleared Coleman on the outside after he was on pole. I overdrove turn one as soon I cleared him and he dove right underneath me." He ended up in sixth place at the Langley Speedway race. At Iowa Speedway, he finished 27th in the 40-car field after running in the top 10 for a portion of the race. "There's definitely the pressure for myself to go out and set a pole or go win some races," Bowman said. "I think that pressure would be there even if Matt and Coleman hadn't won any races. There's defintely no pressure from the team. They all really want to win no matter who's driving the cars. I put more pressure on myself than anybody could ever put on me." Bowman started out the season with three top 10s in a row. 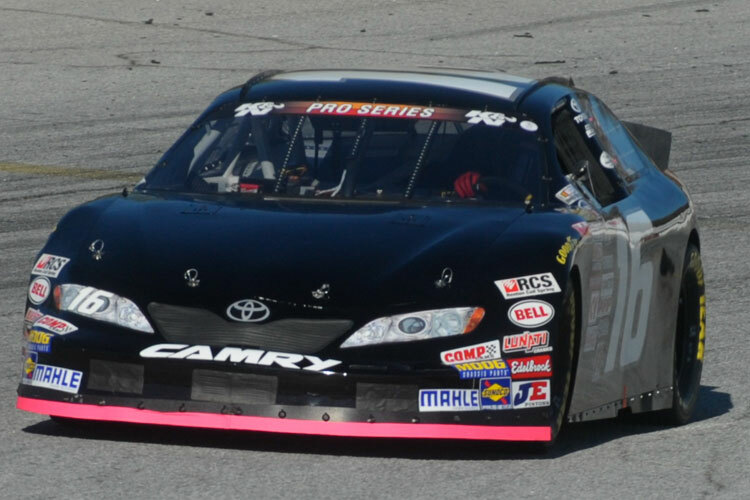 He opened with a third-place finish after working his way through the field from 16th at the start in the season opener at Greenville Pickens Speedway in South Carolina. "It was different. That was probably the perfect race car," Bowman said. "That car made life easy. It was honestly the perfect race car. We actually struggled a little bit throughout the day and got it dialed in really well. We started so far back that coming forward was definitely a learning experience." But he hit a bit of a speed bump in the middle of the season. 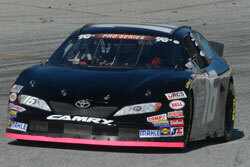 He was able to put his season back on track after the race at Langley Speedway. The races at Iowa Speedway, Bowman Gray Stadium and Gresham Motorsports Park didn't produce the results he anticipated. Still, he said he learned the most about racing stock cars at Iowa Speedway. "I feel like the race that's been the best for me was Iowa," Bowman said. "I think there were 60 cars and we qualified 17th, so it wasn't too bad. We were up to sixth and we blew a tire. We went three laps down. That was only 70 laps into the race. I ran basically 100 laps with no right front fender in traffic around cars. That was a huge learning experience for me. We actually drove up to sixth on the race track with no right front fender. We were just laps down. That was a big learning experience. I still feel like myself and Matt DiBenedetto were the two cars to beat. We both were really fast and both blew right front tires." Bowman said he is looking forward to racing at a couple tracks, mainly because they are bigger speedways that suit his driving style. He might have the biggest advantage at Columbus Motor Speedway in Ohio only because he is the only driver from the East Series who has raced there previously. He competed at Columbus in USAC Midgets. "Honestly, I'm not a very big short track person," Bowman said. "I've been there before and I don't think that anybody that runs the East Series has ever been there. I'm really looking forward to Dover because that's my type of race track. I think we'll run really well there. Obviously looking forward to going back to Greenville because we were so good there." The K&N Pro Series East returns to Greenville Pickens Speedway over Labor Day weekend on Sept. 5. The K&N Pro Series East finale is at Dover International Speedway in Delaware on Sept. 30. "I always was better on the bigger race tracks. I don't know why that is. I'm just more comfortable I guess," Bowman said. "I go to every race to win. I went into this year expecting to win races and contend for a championship. These last couple of races have hurt our shot for a championship. Probably our biggest goal is to win the rookie of the year and we're leading that right now. I just want to win races at this point. That's probably the biggest goal I need to accomplish by the end of the year: to win a race."